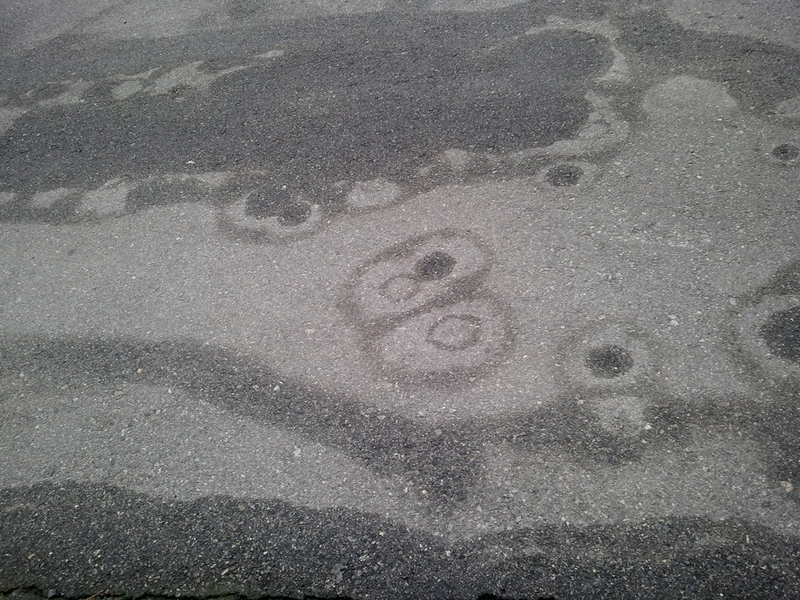 Drying snowmelt and salt created beautifully curvaceous shapes on the asphalt in the parking near the Jack Stephens Center at the University of Arkansas at Little Rock. 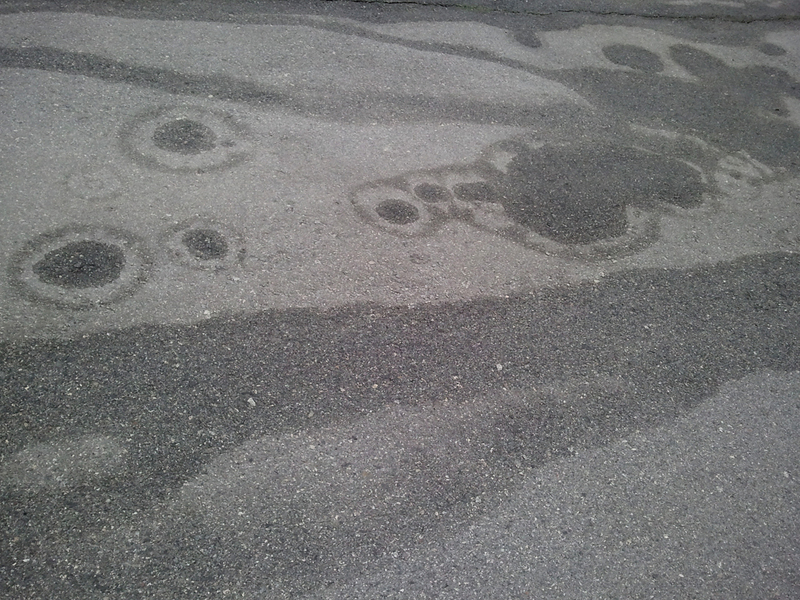 Concentric parking lot evaporation pattern. 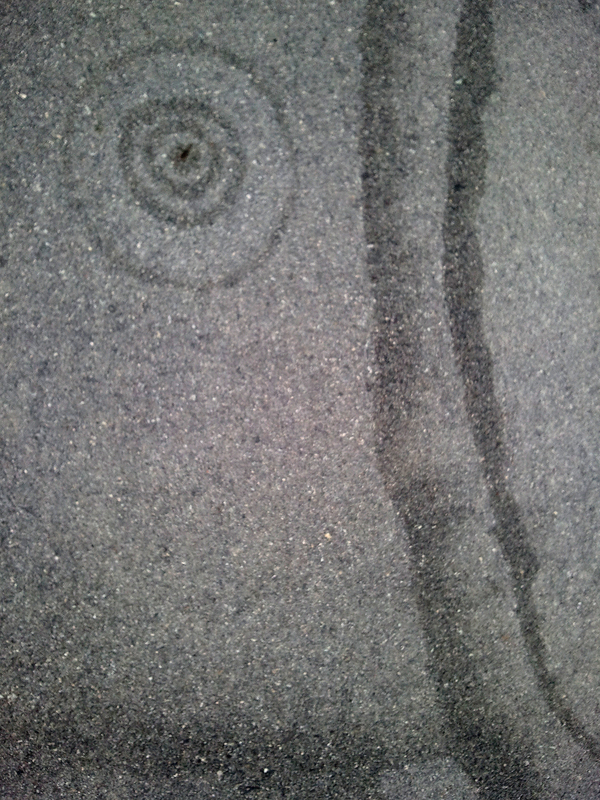 Curvilinear patterns in the parking lot. 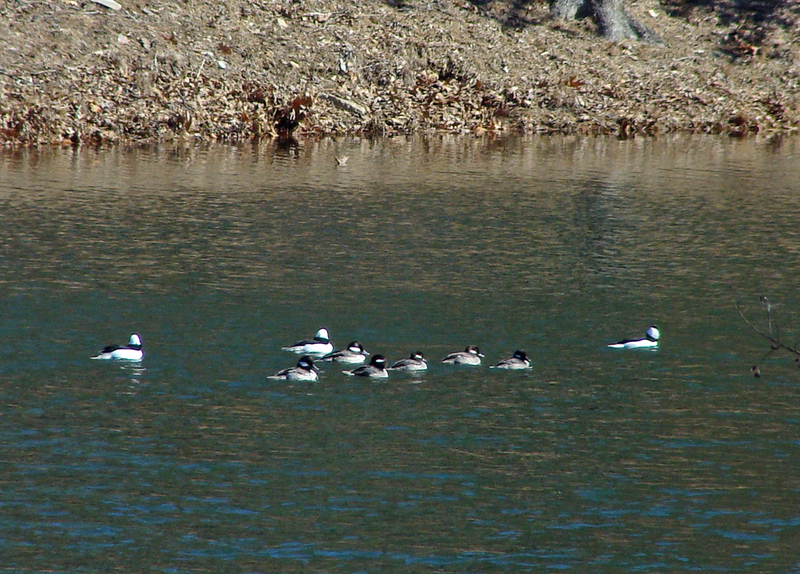 For the past two winters at least, buffleheads have made the pond their home. This year’s collection was the largest we’ve seen. Feb. 13 was a great morning for taking photos. Nearly 60 degrees, a little snow remaining, and the sun was shining all around. Startled by a car coming down the road, the flock of buffleheads takes flight. ... and lands at the other end of the pond. 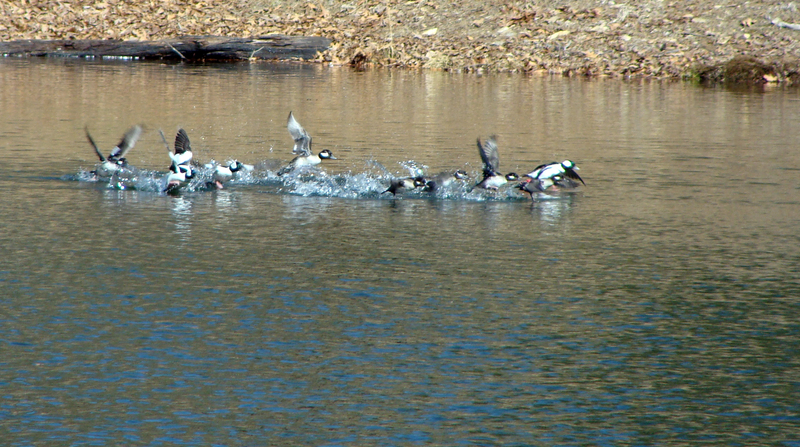 The bufflehead flock moves down the lake on a spring like morning. The morning after brought sun, warmer temperatures and insidious melt and re-freeze beneath the snow blanket. Still, it was beautiful and the sound of running water and birds were the only ones to break the morning silence. 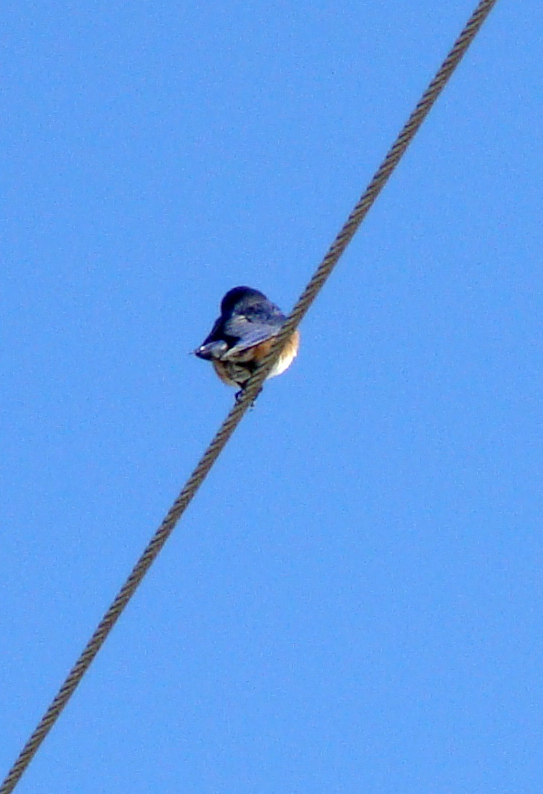 Bluebird enjoys the warm sun. 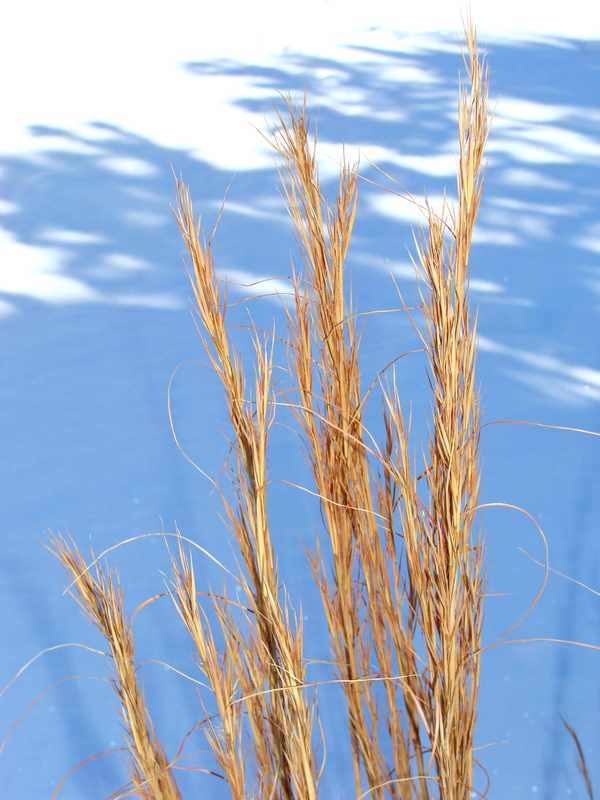 Husks of warm-hued summer grass stand in contrast to the blue snow shadows. Bird tracks cross where dogs, kids and bicycles have been. 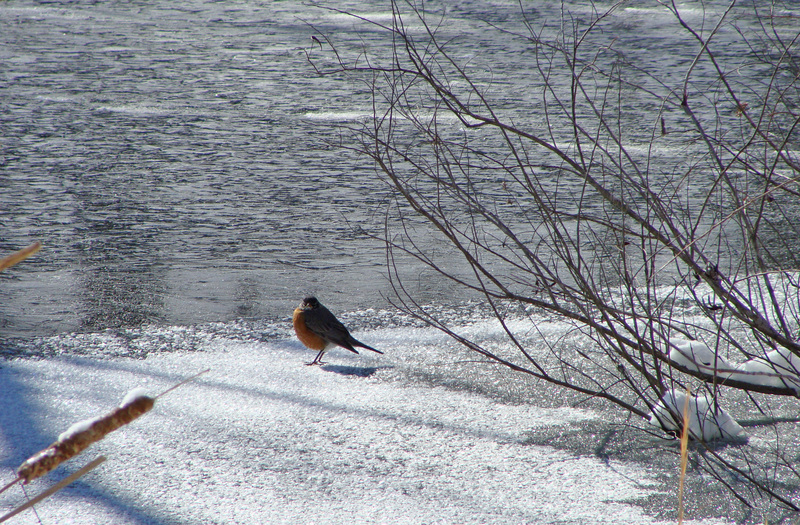 A robin ventures out on the ice covered lake. 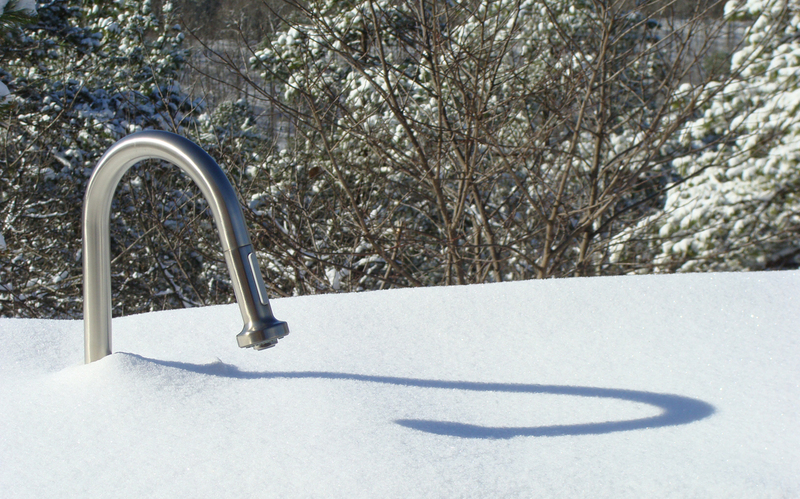 Outdoor faucet casts a clean shadow. 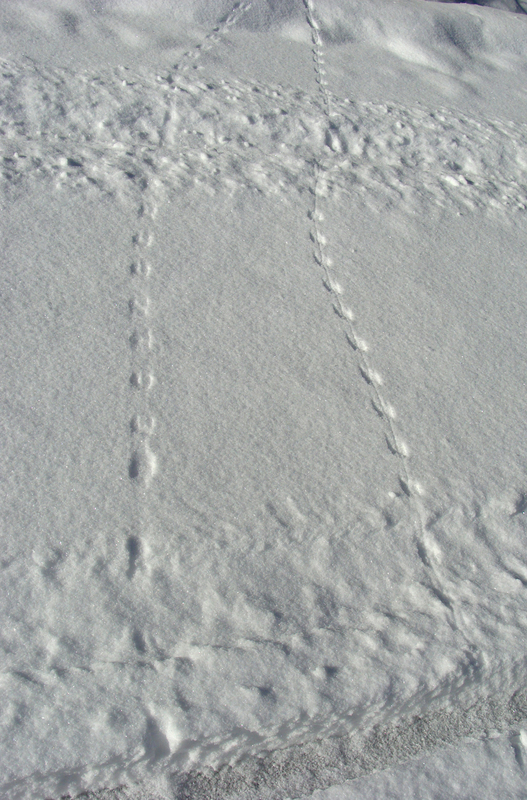 Tracks left by deer on their morning rounds. 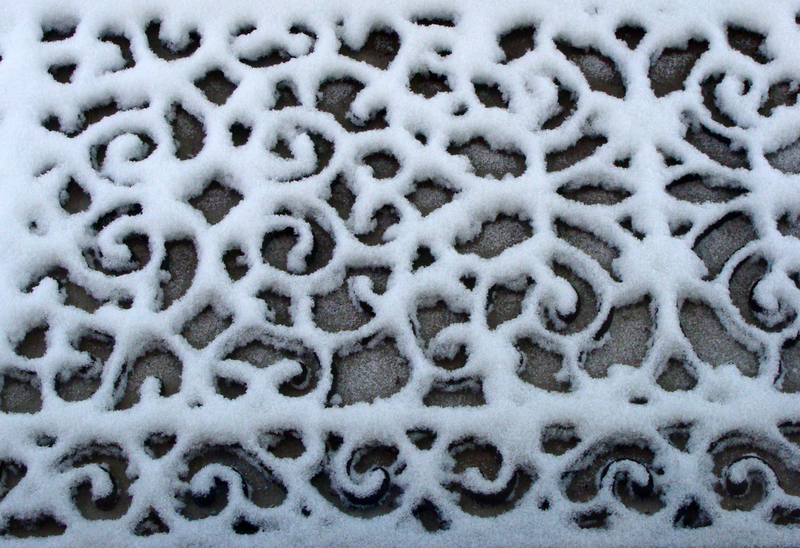 Snow traces the filigree of a doormat. Oh, forgot a caption for this one. 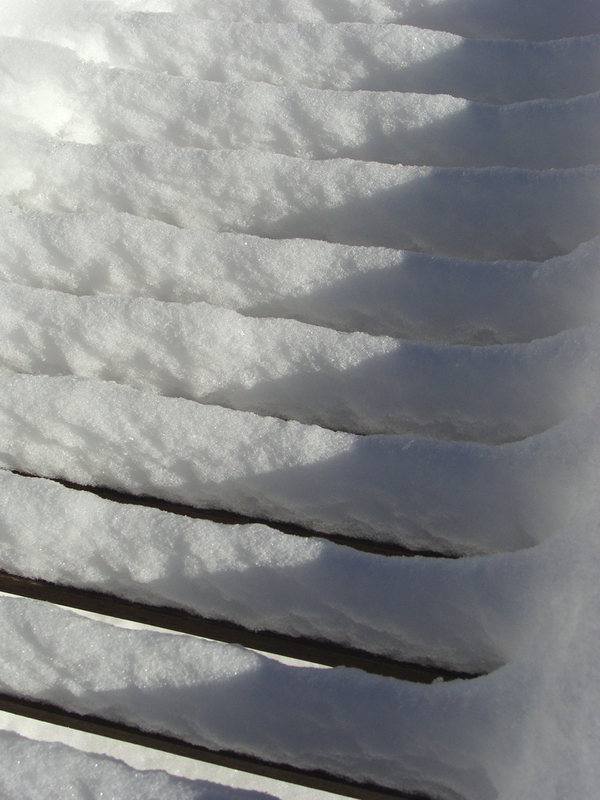 Snow is piled on the slats of a garden bench. Everybody needs a montage. 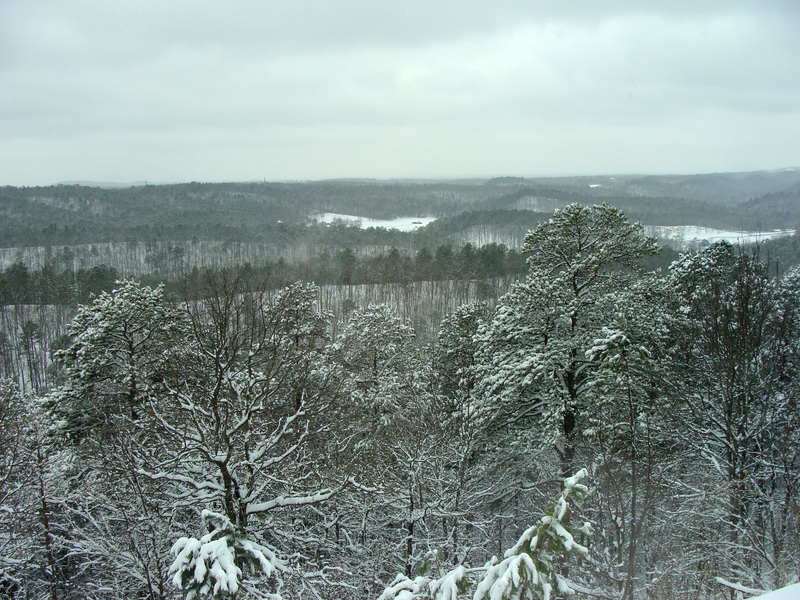 Here’s one showing snow accumulation from yesterday’s big storm. The first very fine flakes begin to fall at 0713 hours. First accumulations at 0901 hours. Snowfall during a brief ceasefire at 1531. When it started up again, the snow would keep going for another eight hours. More than 7 inches of snow, in the sunshine of the day after. 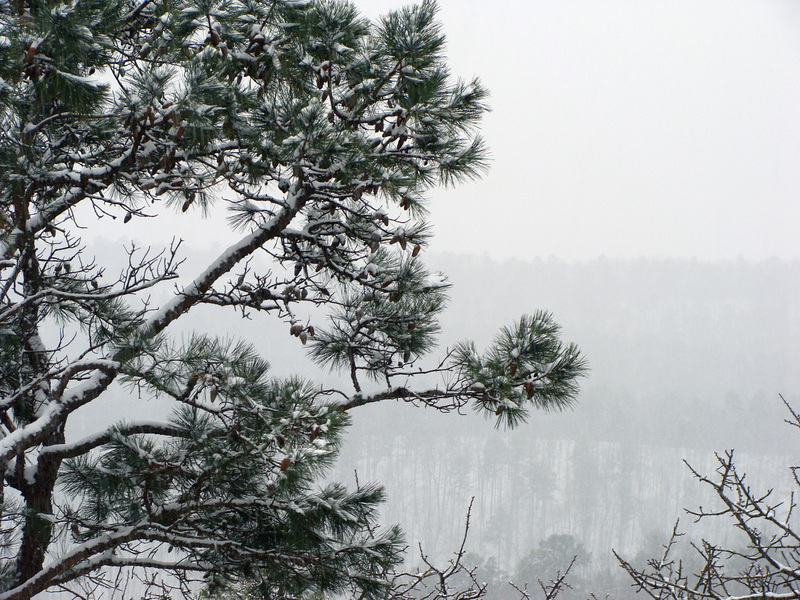 The National Weather Service at Little Rock was calling for up to 8 inches across most of Arkansas, with locally heavier amounts possible. The forecasts for this storm were enough to prompt schools, churches and businesses to keep closed for the day, except for essential personnel. Mother Nature isn’t taking any breaks on this snow day. 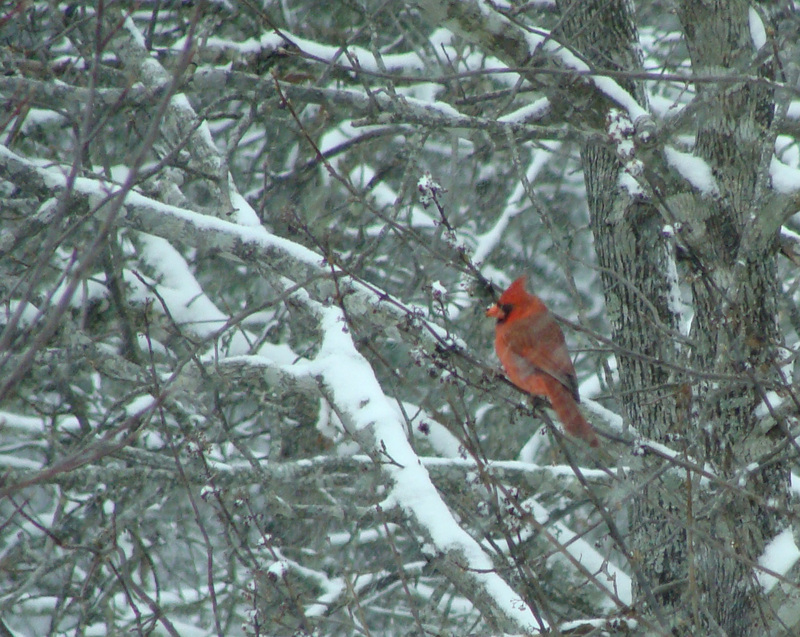 Cardinal plucks what berries he may as the snow falls. 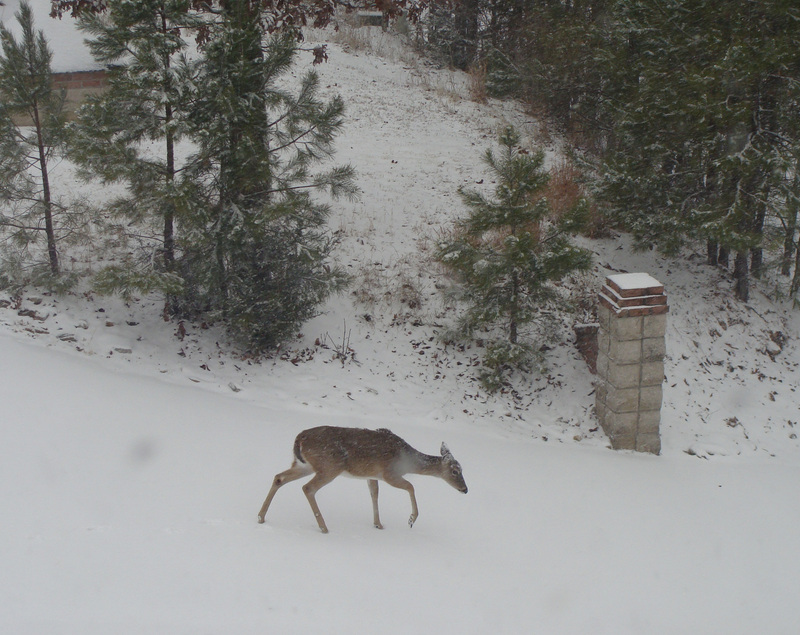 One of a group of four deer, making the morning rounds cutting through the driveway. 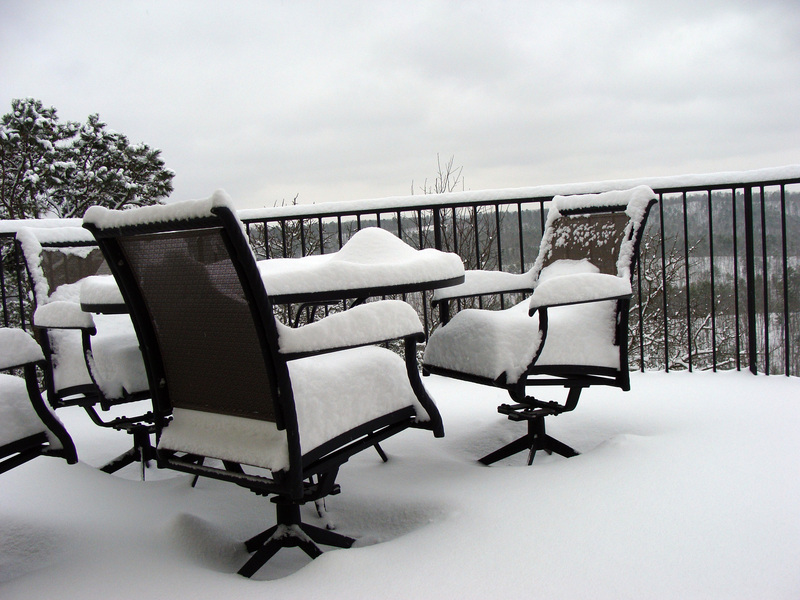 The deck chairs show their white cushions during a snow cease-fire. I'd say Ferndale falls into the "locally heavier amounts" category. 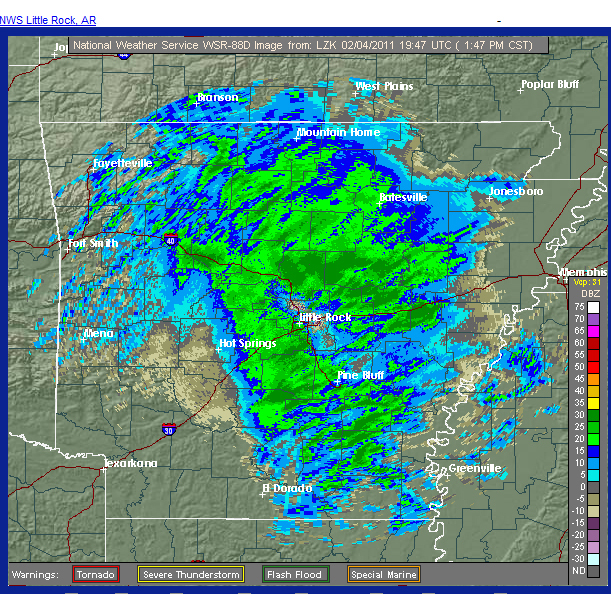 This storm follows one that dumped about two inches on the Ouachitas two days ago. All this snow is a bit of a novelty in the South. Just 20 years ago, Little Rock owned one snow plow. 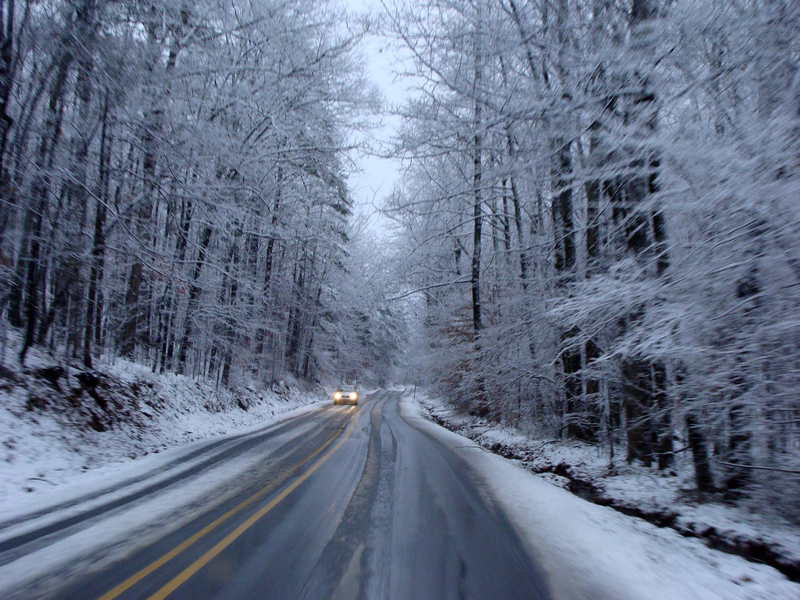 We take comfort in knowing that even the county now owns sand/salt trucks — a blessing out in the middle of nowhere. Real four-wheel drive helps too. 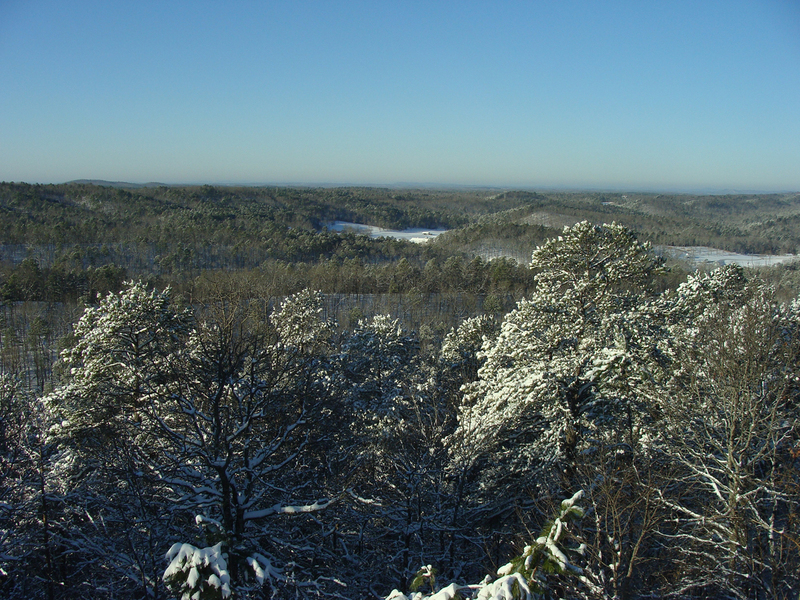 Could be Bavaria in the spring, but it is the Ouachitas in winter. 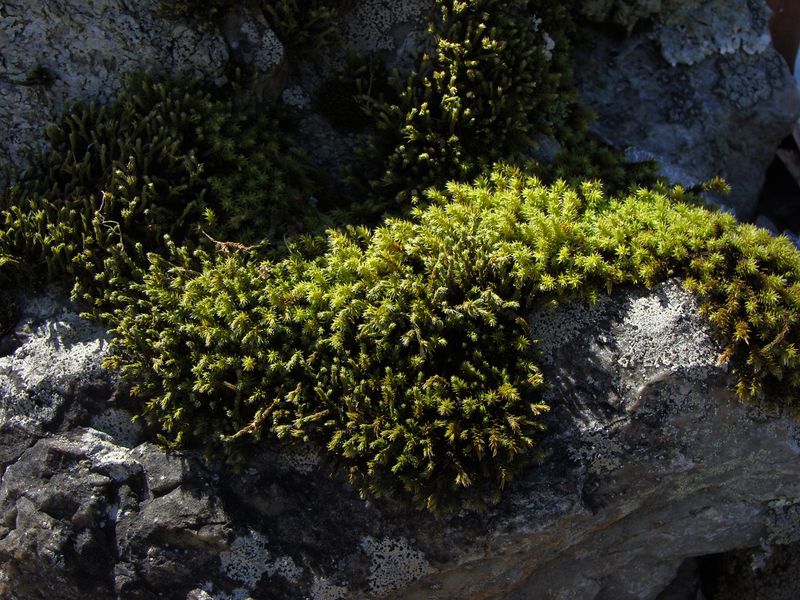 Like Eurydice following Orpheus, spring keeps trying to emerge. 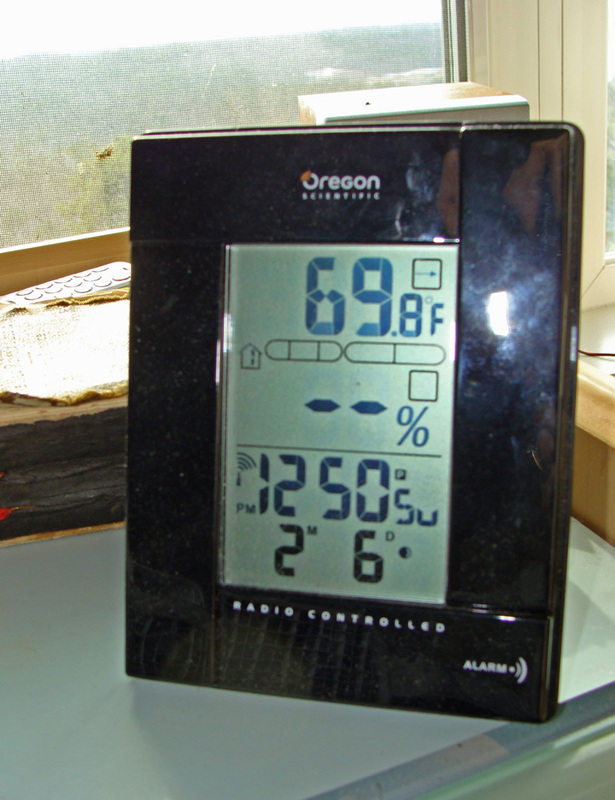 The thermometer hit 70 here in Ferndale. 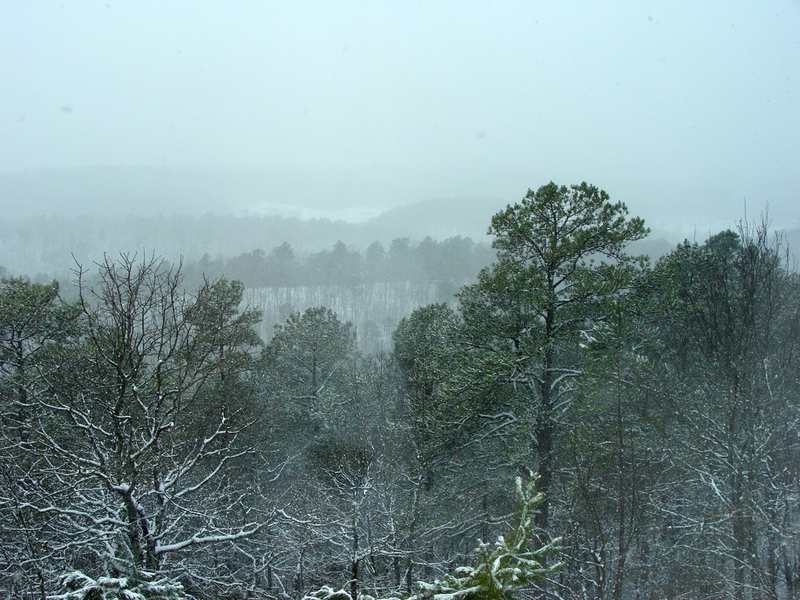 However, Orpheus has turned and we are expecting another 1-3 inches of snow by 9 a.m. tomorrow. 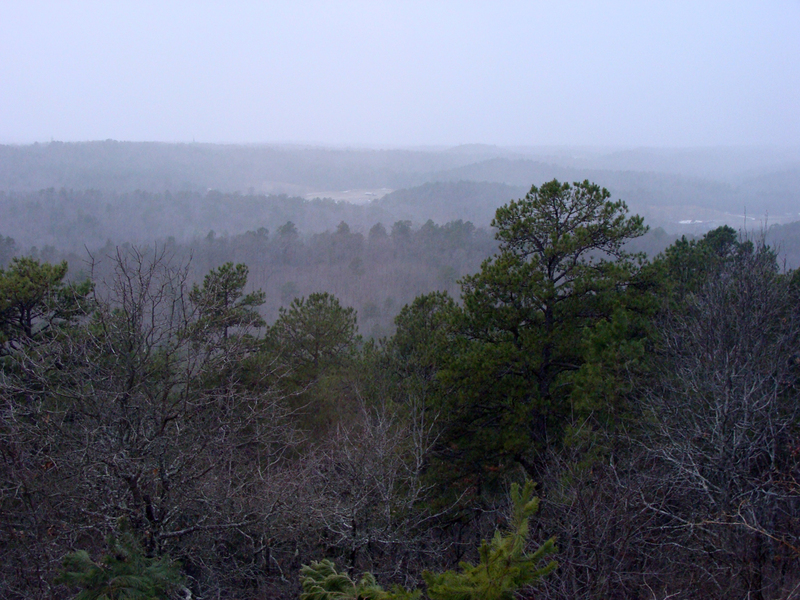 Just a few hours earlier, snow still lingered on the north sides of the ridge. 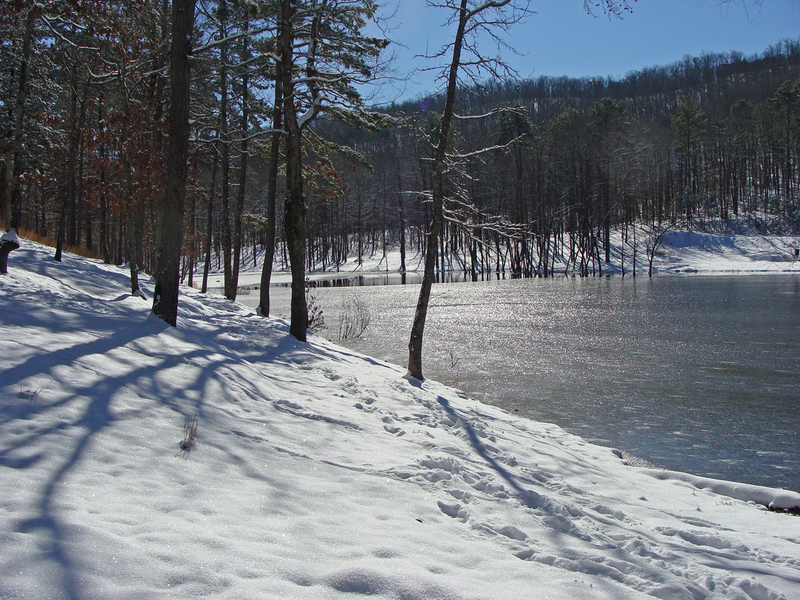 Winter is beautiful in its many combinations of water and cold. Icicles dangle from the eaves. Cold, light and air form magnificent stalactites. 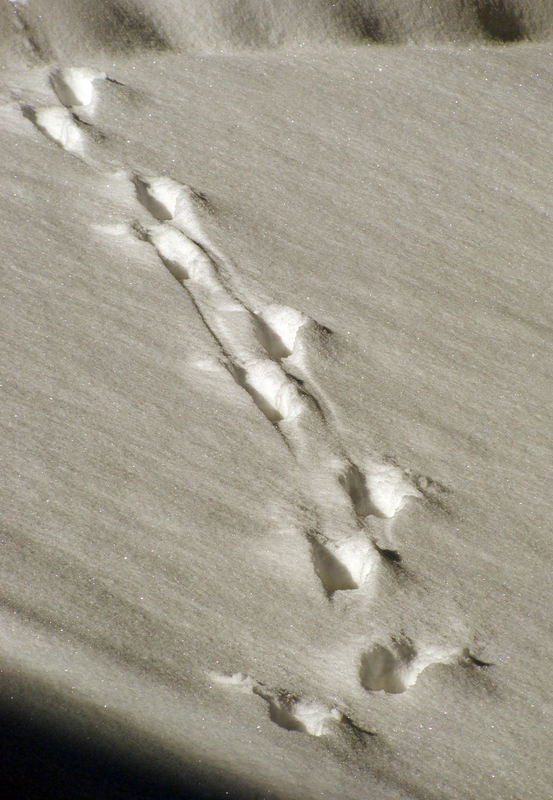 Roving dogs leave their mark in the snow. Sun dapples part of the Ouachita range marching into Perry County. The peak of Pinnacle Mountain peers above the shoulders of the Shinall Mountain ridge. The old saw about Arkansas’ weather has proven true. Just days after record highs in the 70s. The scene was more wintry. 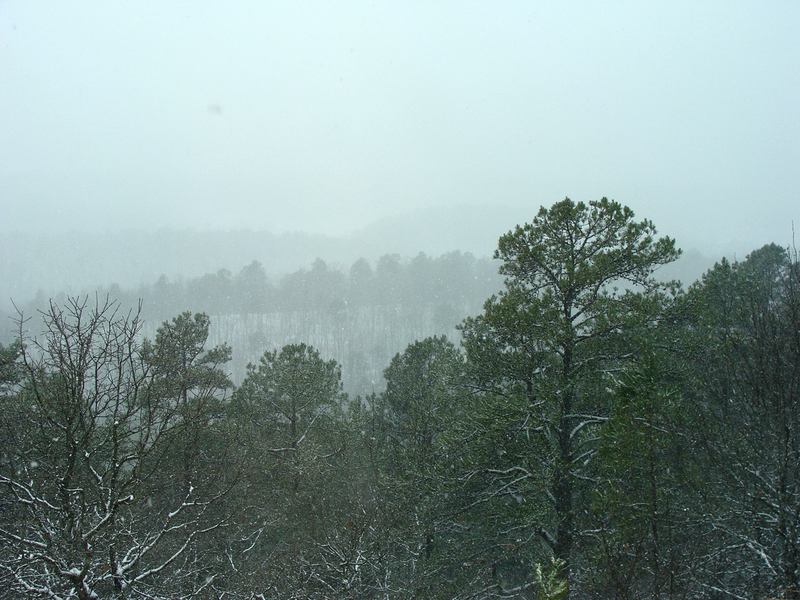 Heavy snow falls in the Ouachitas. And how our little winter storm appeared on the National Weather Service Doppler image around 1400 hours.